Cargo Ship, oil on canvas, 48" x 72"
A painting by Yugoslavian artist Relja Penezic, from his Sky, Ocean, Cargo... series. Seems a waste of time to paint something so perfectly. No need to guess, though, that the quest is perfection. Chase reminds me of Chevy, gosh is our government gonna' bail them out? This ship is seen from the stern where the superstructure and exhaust funnel would be. But instead the stern is filled with container cargo. The superstructure appears to be at the bow. A whole new design in container ships! 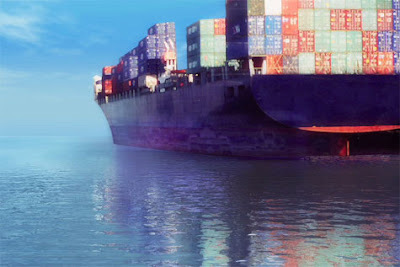 It is somethng about those container ships, isn't it? Although this kind of realistic interpretation in not my cup of tea. Here is my contribution towards this abstract subject.